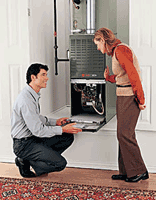 Are you in the market for a new furnace? Maybe your old one is starting to fail, or perhaps you are building a new home and need to install a furnace for the first time. Whatever the reason you are considering a furnace installation in Burlington, NC, there are many different types to choose from. Finding the furnace that is best for you depends on a few different factors. Do you have allergies? If dust is an allergy irritant for you, forced air systems with ductwork may exacerbate that issue. Try an air purification systems that can be added to help filter out allergens. Does your home have ductwork? If there is already ductwork in place in your home, installing any type of forced air furnace is much easier and cost effective. Ductwork is necessary for furnaces and heat pumps. If it doesn’t have ductwork and you wish to avoid installing ducts, try a radiant heating option or a ductless mini-split system, though this type of system is rare in this region. How cold does it get where you live? If you experience extremely cold temperatures, avoid a heat pump which does not perform well in those conditions. Consider a boiler or furnace that uses propane or oil. Propane and oil are said to offer a cozier heat that radiates longer. Do you want the lowest possible heating costs? To keep heating costs as low as possible, propane, heating oil, and gas furnaces are very cost effective. Heat pumps are a very energy efficient and cost effective option as they transfer warmth more than they create it using heating fuel. However, when it does get very cold, a heat pump would need to be supplemented with another source of heat. Do you want to save on installation costs? If you want to keep installation costs down, consider a ductless system such as a mini-split HVAC system. These are wall-mounted units that are installed in each room that connect to a very small outdoor unit. Installation is quick and not at all invasive. These systems are very visible and many homeowners opt for other options for aesthetic reasons. Is it necessary to heat each room separately? If you want individualized heat and air conditioning for each room of your home, the ductless mini-split system is the best way to achieve this. Each room can be set to a different desired temperature. Each person can heat their room to their preference and parts of the home that don’t need to be heated can do without a unit. These systems do require more upkeep, such as monthly filter cleaning, so be sure to consult an HVAC professional to ensure you pick the right system for your home and climate. Trust your home comfort to Alamance Oil. Proper installation is key to the successful operation of the furnace you are getting now, as well as any future furnace you will have installed. Ductwork, vents, and the system itself must all be configured accurately. Once you choose the right heating system for your home, be sure to have your furnace installation in Burlington, NC, done by Alamance Oil. Call (336) 226-9371 for a free estimate today.